A long while back, I posted a recipe for quinoa stuffed bell peppers. This recipe has become a staple here at our house, since it is so quick, easy, healthy, cheap, and makes great leftovers. Now that I've made it a number of times, I've altered the recipe into a favorite. I thought it would be worthwhile to update the recipe on the ol' blog, since I actually reference the old post often! I basically make the bulk of the recipe the same way, but instead of baking the peppers as the original recipe instructs, the end result is much more delicious and beautiful if you grill the peppers! They only take a couple of minutes which cuts major time off the preparation. An alternative for those who don't have a grill or don't prefer to grill year-round as we do, you could also fire them on the gas oven for a minute or two (be careful if you do this!). Additionally, the quinoa makes great filling in a tortilla, topped with salsa! This is another version that we love to make for leftovers the next day when the bell peppers are gone. To be honest, the quinoa mixture is delicious on its own! This is a really great versatile recipe and I'd encourage anyone looking for something new to try to give this recipe a shot! Bryan requests it at least every other week! Heat oil in a large pan over medium heat. Add onion and celery and cook 5 minutes, or until soft. Add cumin and garlic and sauté 1 minute. Stir in mushrooms and tomatoes (with liquid). Cook 5 minutes. Stir in quinoa and vegetable broth. Cover and bring to a boil. Reduce heat to medium-low and simmer 20 minutes, or until quinoa is tender. Remove from heat and stir in black beans, corn, and 1 cup cheese. Season to taste with salt and pepper. Grill peppers for a couple of minutes - they will still be crunchy, but slightly cooked. 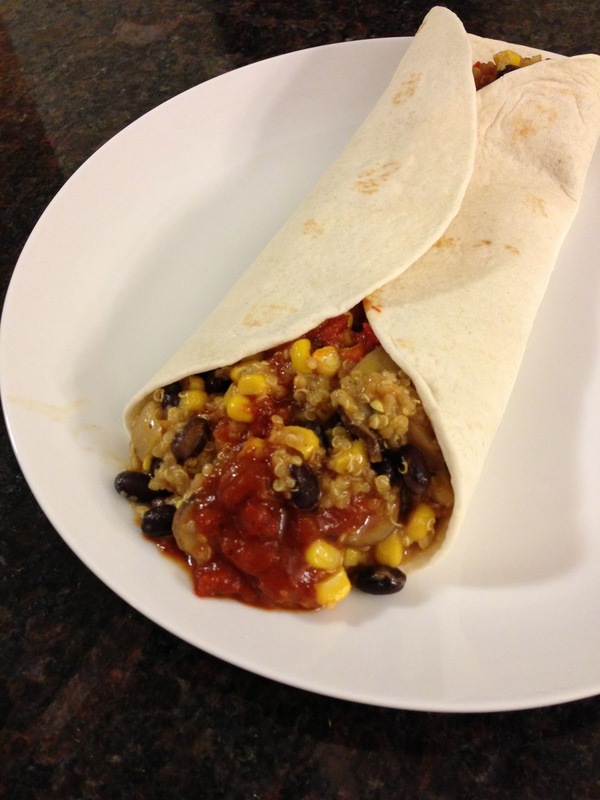 Serve by stuffing quinoa mixture into peppers or in the center of a tortilla, burrito style. Top with remaining shredded cheese and salsa, or serve salsa on the side. Enjoy! One semester down, Two to go!! !